My next scarf project is completed, fresh from vacation on Nov 19th Shar gave me another challenge how about learning a new technique increasing and decreasing by making a diagonal scarf. 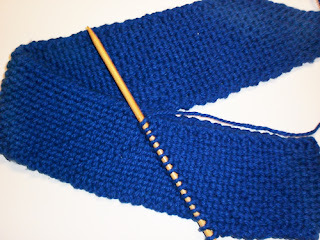 I was up for the challenge, plus with my limited experience, I was starting to understand that the less stitches I cast on and using a larger needle this project would knit up very quickly indeed. My black Friday was spent trying to get more Bernat Royal Blue yarn for my scarf, the pattern from blog.nobleknits.com uses only one ball of yarn with a US 15 needle. I used a different brand of yarn and a US 11 needle size that called for a bit more than one ball, to get the desired length scarf I wanted.